Last weekend was a marathon of moving things that we can use to our homestead. It started on Friday. Sean removed the seats of the van in order to bring home a free load of maple logs to split from one of his job sites. He piled the logs onto the stack of wood already waiting to be split. Molly was a great help. Look how low that van is riding. Yikes!(1). With the momentarily empty van, we went to pick up the cider press we are borrowing from our friend Jenny of Pebblestone Farm. We delivered the press safely home (2). In the afternoon, we drove to grab a quick load of hay for the goats- six bales tetrised neatly behind the middle seat (3). 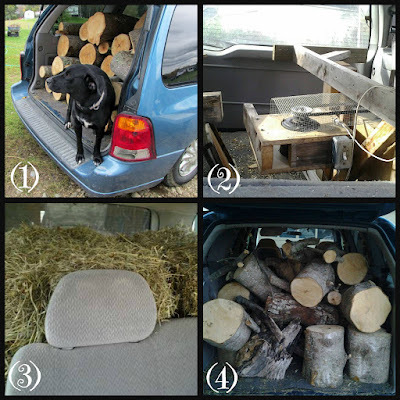 We dropped the hay at home, delivered our girls to visit their Dad for dinner and loaded the van for the final time that day with logs of white pine and butternut to add to our happily growing supply of wood for fuel. On Saturday, we spent just slightly less time in the van. After spending the morning preaching the word together, Sean and I spent a little time in the afternoon picking all the apples we could gather from a neighbor's tree before the rain started up. Working together, we collected about 100 pounds of apples- a good beginning, but with me wanting to preserve 10 gallons of apple cider in the freezer for the winter months ahead and Sean wanting to ferment 10 gallons into hard cider, we'll need more apples*. Saturday night, Sean and I and my Mom took our girls to see the play, Mary Poppins at the Grand Auditorium in Ellsworth. 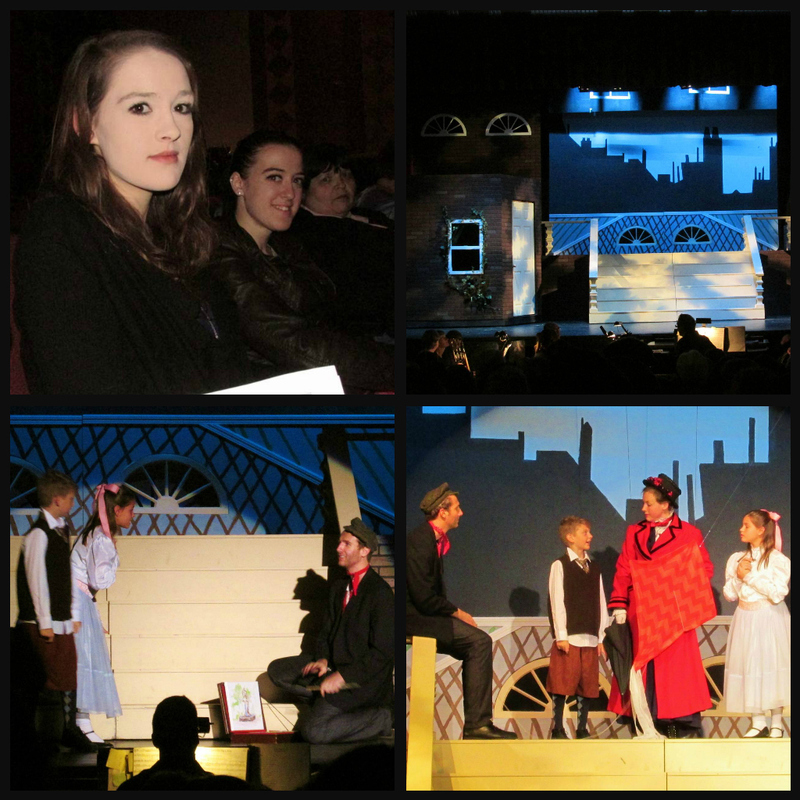 It was charming and wonderful and an absolute treat to reward us for the previous two-day's strenuous work load. The cast was dead on, the sets were perfect, and the story borrowed from the original book and the Disney movie, meshing together a delightful 3 hour tale. After Sunday's meeting for worship, Sean and I drove to Windsor to meet us a duck; Lady Chapelle's potential mate. On the way there, we encountered a raccoon sitting along the side of the road. While we would not welcome a raccoon to take an interest in our homestead, we did not wish to see this one hit by a car along the busy roadway. It was a concern that he or she was out and active during mid-day, a possible sign of being sick, injured, or rabid. Still, we couldn't just drive by and leave it to chance that it would cross the roadway safely. As we approached in the van, it was clear that this one had been injured on its rear leg- maybe broken? As we watched it, we thought it was probably only sprained or strained. Perhaps it had already had a slight encounter with a car. Who knows? Barring taking it to a vet, which could have placed us in harm's way, the only thing we could do was to watch it closely and see it safe into the brush when it tired of our staring. That didn't take long. But, its eyes were clear, wary of us, and alert. It did not cry out in pain as it walked and it could walk. We couldn't be sure, of course, of any of our suppositions, but we were glad to see it scamper into the tall grass under its own power. We hoped whatever injury it had would heal on its own in time. At least, it was in no danger of getting hit by a car on the road for the moment and Sean did not get bitten by the potentially rabid critter. Ain't nobody got time for that! Boris standing in front of Chapelle. All of the drakes available for sale were handsome lads, but it did not take too long for me to know that Boris was our guy. Sleek black feathers with a shimmering sheen of green along his back, big and healthy, Boris was our favorite. He wasn't terribly impressed with the idea of travelling, despite our assurance that he was going to love his new digs. After all, coming from a duck enclosure with 6 other Muscovy drakes into an enclosure where he was the main man and a lady all his own to love had to win us some points. He was unconvinced on the drive home. Boris quickly changed his mind upon seeing Miss Chapelle. It was duck love at first sight and the two have been inseparable since. 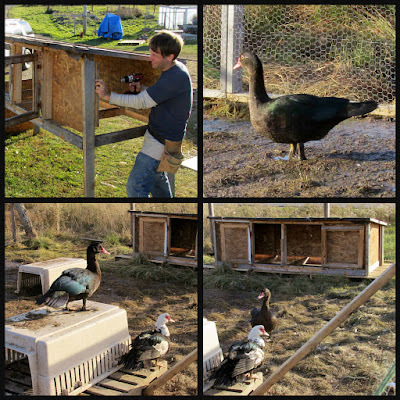 We released them into the main coop area yesterday after adding additional fencing panels to expand the duck yard further. The duck yard area will grow in size and eventually the "pond" will be dug out properly to everyone's satisfaction. But, it is sufficient for now. Sean spent a couple hours turning a large rabbit hutch into a new duck house. We removed the legs, took out the chicken wire walls and welded metal floor and installed new OSB interior walls. The roof of the house is finished with tar paper over wood boards. Next spring, we will remove them and install rigid, clear plastic greenhouse panels for a roof. This will let in sunlight and warm the inside of the house when the weather turns cold. The exterior will sport red aluminum siding to complete the house. The house sits off the ground, on three good wood pallets we found beside the road on our way home Sunday afternoon. I love breathing new life into repurposed finds. The total cost for this project will be 2 sheets of OSB and the price for the aluminum. 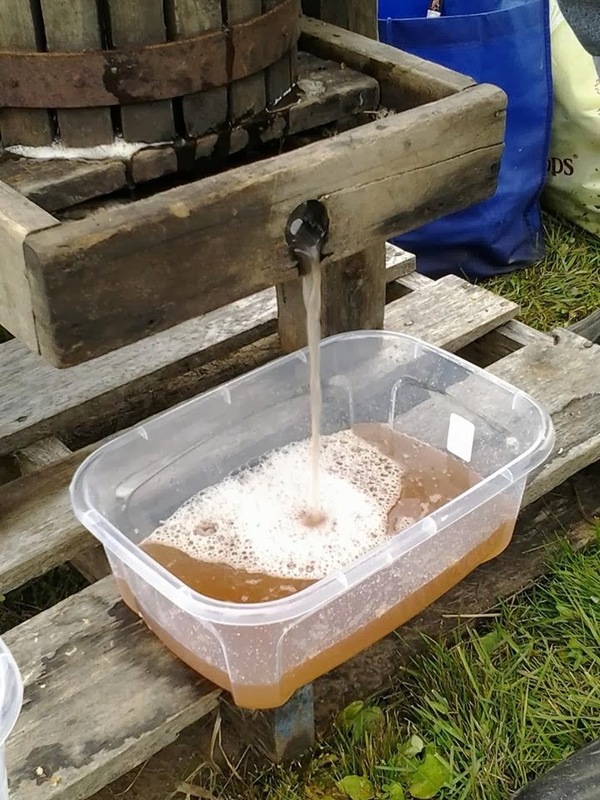 *We will sharing our apple bounty with our friends and neighbors, opening our homestead this coming Saturday, October 24th from 2-5 pm for cider pressing. Bring your own apples and containers and use the press for FREE. Or, for those who prefer to use our apples and containers, a limited supply of raw apple cider will be available for purchase for $5 per gallon. Our studio will be open, too. Gentle Meadow Goat Farm is joining us for the day as our special guests; they'll have goat's milk lotions and other farm goodies with them. I hope you'll try a piece of my Third-Place Apple Pie. ♥ Remember friends, this is a WORKING homestead with animals who poop... without notice... a lot. It is just a reality of life here. If you plan to walk around the homestead and visit with the animals. we strongly recommend wearing rubber boots and maybe bringing a change of clothing for children- in case they get "muddy". We'd love to see you and hope you'll stop in for a visit. Full details are available on our FB page HERE. Thanks for joining us today, friends. We're very glad you're here. Boris looks VERY happy and Frosted Flake is also pleased to have one less male suitor!